The island of Grenada, known as the Island of Spice due to the vast mace and nutmeg industries that make up a huge portion of the country’s exports, is only 35km long and 19km wide, but it offers a variety of diving sites for beginners through to technical divers. We booked our 2-tank dive online from Canada choosing to go with Devotion2Ocean due to their excellent reviews, quick email response times and seamless on-line registration system. 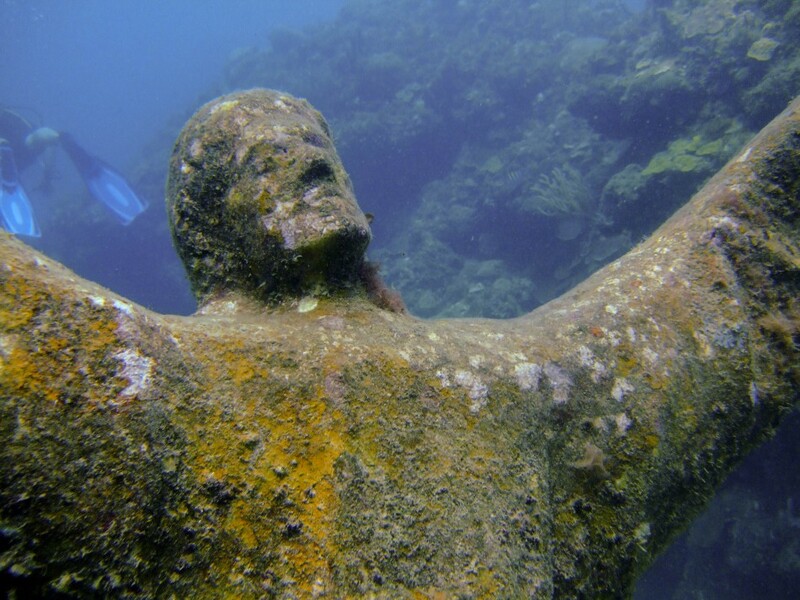 We had wanted to try wreck diving as we hadn’t done that before, however, Grenada is noted for having the world’s first underwater Sculpture Garden. Since our attempt at diving Cancun’s underwater sculpture garden in Mexico had been cancelled due to weather, we thought this trip would surely give us the chance to see something very cool. We had hired a nanny to watch C and on the morning of our dive she arrived to take him to the beach to build sand castles. We were staying at the Rex Grenadian Hotel and his nanny for the day normally ran the little hotel shop that sold beach toys and other paraphernalia. We visited her everyday before our dive tour so that they would have a chance to get to know each other. Our beach front room meant that the sand was just outside our room so C could play without being too far away so he could easily take his morning nap. SCUBA diving is one of the top things to do in Grenada, so we were anxious to get started. We hadn’t done a reef dive since our trip to Hawaii a few years prior (although we have been cave diving in Mexico and we went dry-suit diving in Iceland) but as soon as I got in the water, it felt just like yesterday. The warm water was soothing and I opened my eyes wide in amazement at all the colourful coral and fish that surrounded us. Flamingo Bay (6 – 27m) is an easy reef dive located on the west side of Grenada within the northern portion of the National Marine Park. Before the dive, the dive masters had explained to us that they would be carrying spears with them. When Hurricane Ivan had made landfall in Miami, it had caused some damage to the Miami aquarium and three mating pairs of lionfish had escaped their enclosures. These 3 pairs of fish mated and the population of lionfish exploded into tens of thousands within a few short years. The fish have become tremendously invasive and have damaged the local populations within the Caribbean. As the dive masters speared the lionfish, they attempted to introduce them to the local apex predators in an attempt to entice them to make meals out of the live lionfish. From the lack of interest of the local fish, it seems like it will be an uphill battle. After some surface time on the boat to change our tanks and grab a snack, we jumped again into the waters of the National Marine Park but this time in Molinere Bay to explore the underwater Sculpture Park (4 – 10m). The Park became accessible to the public in 2006. 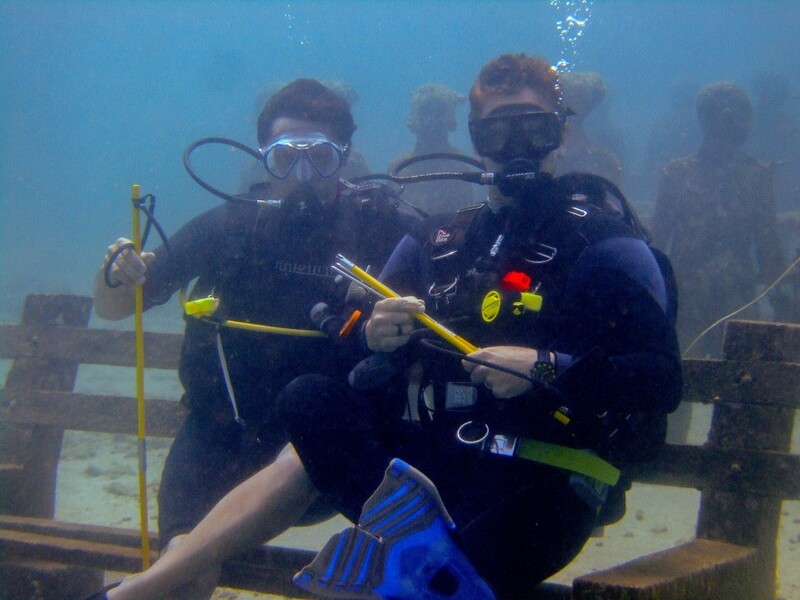 The goal was to create an artificial reef in order to relieve some pressure on the natural reefs in the area which have been extensively damaged by recent hurricanes and are heavily visited by scuba divers. Originally, all the sculptured art was created by Jason deCaires Taylor but it has since expanded to include other artists such as Rene Froehlich and Lene Kilde. There are more than 65 sculptures scattered over 800 m². The sculptures depict scenes from everyday life such a man typing, a person on a bike, and a group of children holding hands. The man typing on a typewriter with pieces of newspaper clippings on the desk is also known as the “Lost Correspondent”. The sculpture is supposed to draw attention to the ever-changing way we communicate. The group of children holding hands is also known as “Vicissitudes” which is defined as a “natural change or mutation visible in nature or in human affairs”. The group of 26 children were modeled after local citizens in Grenada and took 15 tons of concrete to create. There has been much debate as to what they represent. 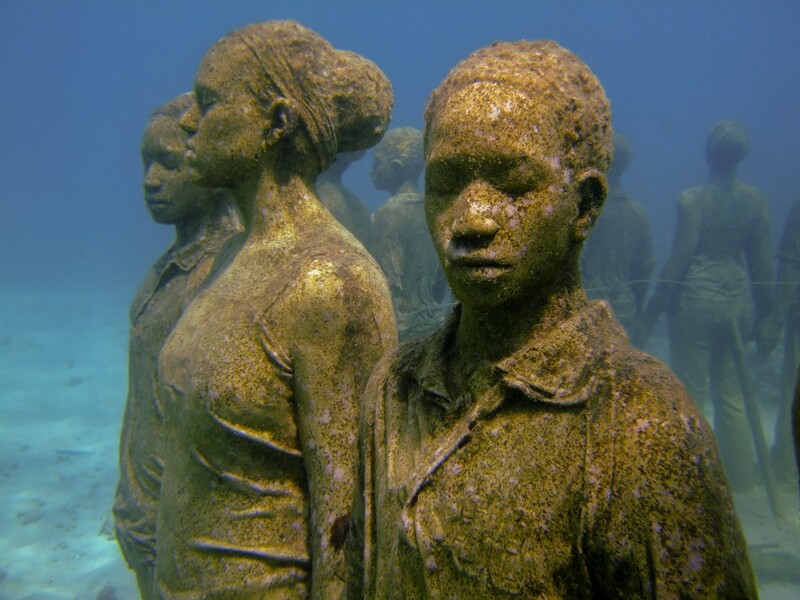 Jason deCaires Taylor has stated that they are supposed to represent “unity and continuum” and was not meant to be about slaves that were thrown overboard in the Middle Passage. Whatever their original intent, the piece of art is truly inspirational. 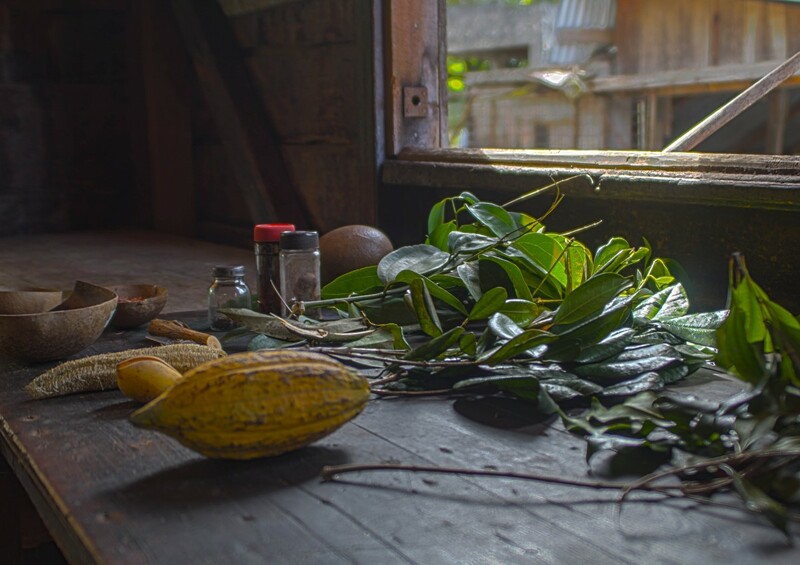 There are also several carvings by local artist Troy Lewis which depict Amerindian art, culture, and spiritual worship. Gliding amongst these statues truly sparked my imagination. The range of emotions I experienced varied from humour as we explored a man riding a bicycle 5m under the water while tropical fish zipped through his spokes, to awe as we swam through a small cavern that opened up to show a circle of lifelike people all holding hands in unity, yet slowly being shaped by the ocean into an entirely new vision. I let out a bubbly laugh as we each took a turn sitting on a park bench surrounded by young corals, yet wanted to reach out to the “Lost Correspondent” and discuss the nature of our shrinking World. 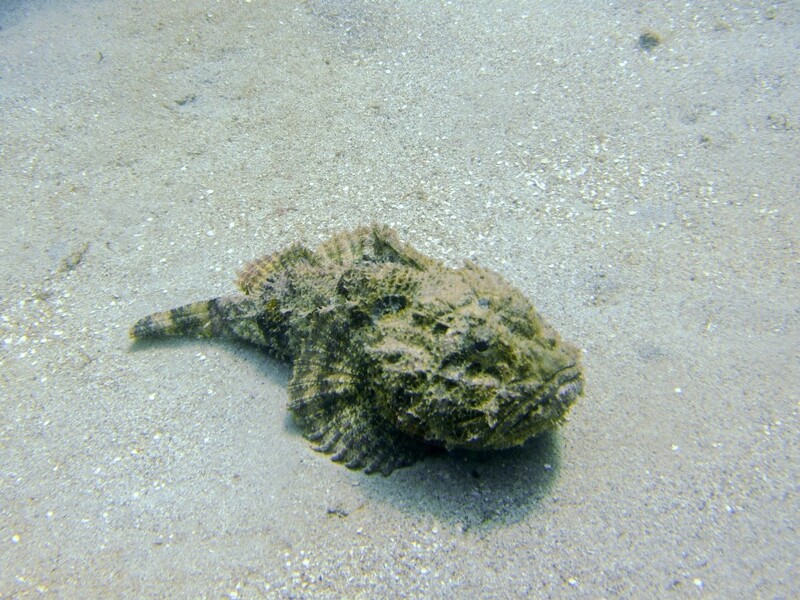 We even saw a lonely scorpion fish hanging out in the sand between the corals. Since our visit, “Fall from Grace” which is the sculpture of the man on the bicycle has been restored and the man now rides a shiny blue bike. “Vicissitudes” has also been replaced and is now made with materials that should last much longer. 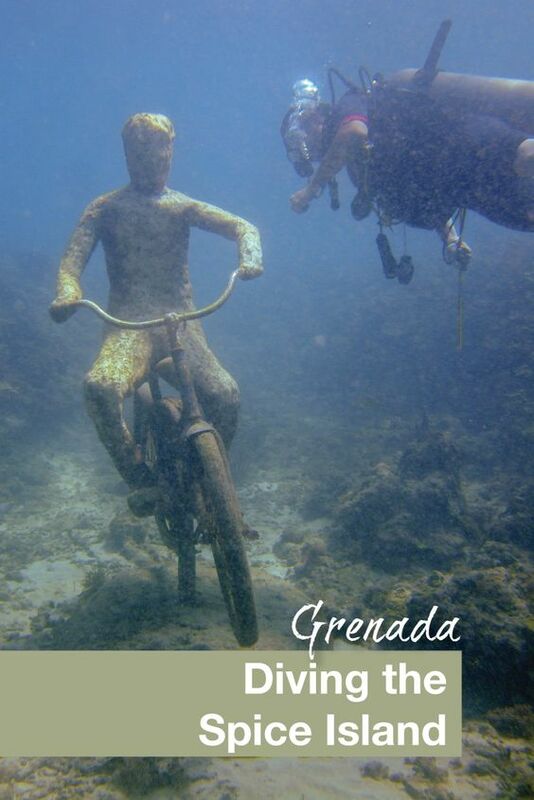 The Underwater Sculpture Park is maintained by The Grenada Underwater Sculpture Management Inc which is a non-profit organization manned by volunteers and for those who are interested many sponsorship opportunities are outlined on their website. We had an amazing time diving in Grenada and we can’t wait to go back to see how the artificial reef has evolved! Wow, what an amazing experience that must have been. I’ve never done any diving, but that underwater sculpture park might be enough to motivate me to try it! Happy to hear that Nikki! Thanks for the comment! Adding to our list of diving destination! Looks amazing! 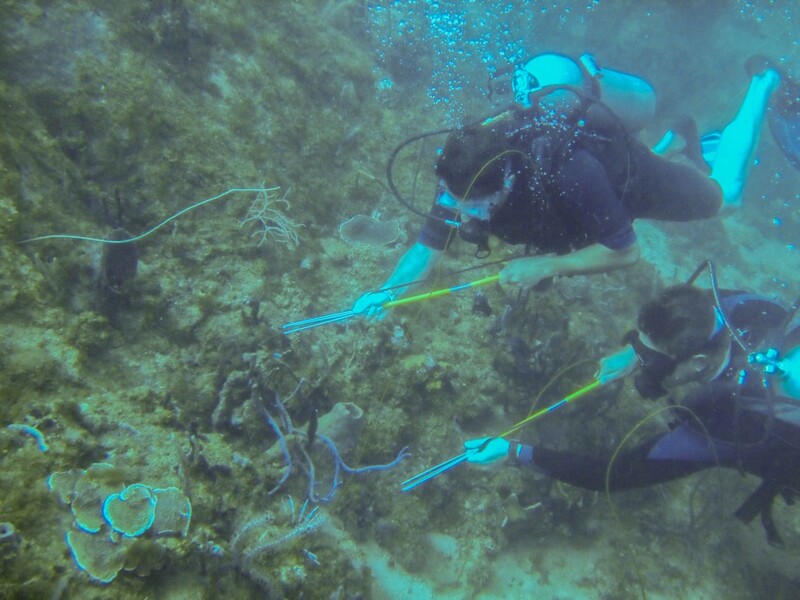 Lionfish is also a big issue in Bonaire – pretty but so invasive! Have yet to do cave diving (Yucatan Cenotes high on the list) and thinking about the dry-suit too. Cool photos – are these on GoPros? I’ve seen in this on NatGeo but never seen anyone who’s actually been! Truly unique and beautiful. Definitely on my To-Go list! These photos are so incredible! What camera do you use? Also, that is CRAZY about the lion fish! Who would have thought 3 fish could be so potentially damaging? Such an interesting post — thanks! Wow what cool experience. I have heard a lot about Grenada, and being that it is tropical..I would love to go! Your diving pictures are wonderful!! I hope to travel more soon, maybe I will make it to Grenada! That looks like such a fun and amazing experience. Definitely adding this on my travel to do list. Wow. What truly stunning photos and what an incredible adventure this must have been for you. This is definitely something I’d love to do someday! Wow, what an experience! That underwater sculpture park is absolutely stunning. Wow, what an adventure this must have been. Your pictures really draw me in and make me want to visit. I’m terribly afraid of the water, so diving is something I’ve never thought of doing. However, your photos make it look like so much fun! Those underwater photos are amazing. 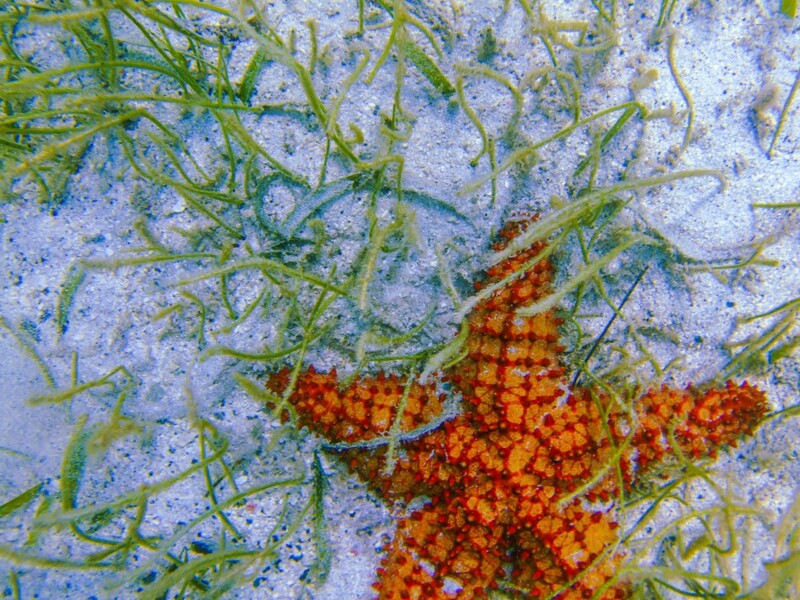 WE went to Turks and Caicos in October and that was the first time we had gotten to see sea life like that. it really is breathtaking. Looks like a wonderful place to explore. Such an incredible experience that must have been, I envy you guys a tad bit 😉 Amazing pictures and that sculpture park looks too cute to be underwater (what will non-swimmers like me do, sigh). What great picture! I love the ones of the fish. Do you know what kind they are? This would be fun but I am not sure I would be able to scuba dive – I am baby under water. Diving and enjoying the beautiful world under the sea is itself a beautiful experience, but here you have a fascinating array of sculptures underwater, really a unique experience. What a cool experience! I love seeing all the underwater pics.